Orthotics are orthopedic devices made of lightweight materials that range in complexity from simple shoe inserts bought over-the-counter to custom-made devices that require impressions, casting, and computer technology to create. The two should not be confused, however, since there is a great difference is quality and effectiveness. Mass-produced, “one-size-fits-all” orthotics cost less, but do not always properly correct the problem in the buyer’s foot, and they sometimes do more harm than good. Still, the purpose of all orthotics is to permit the healing of various foot conditions such as Achilles tendonitis, bunions, plantar fasciitis, and tarsal tunnel syndrome, among others. If you are suffering from one of these conditions, you may want to discuss orthotics first with your podiatrist. For example, if you are about to begin a new job as a valet attendant, your job is going to entail a great deal of running. Before starting work, you may want to consider purchasing a shoe insert. The insert provides additional cushioning to your feet and ankles, which can prevent or reduce soreness and inflammation. If you are an athlete, you may want to consider having a custom-made device prescribed by your doctor, especially if you are a runner. These custom-made devices cost more than those bought over-the-counter, but they are sometimes more supportive and last longer. Get information on new foot and ankle orthotics here. Generally, foot specialists group orthotics into two categories: functional orthotics and accommodative orthotics. However, there are several types of orthotics. Functional orthotics are designed to support abnormal foot biomechanics. They are usually made of materials such as plastic polymer and are good for reducing foot pronation (foot flattening). They also help with shock absorption while you are walking or in motion. Functional orthotics are used to correct various foot deformities while supporting the rear foot and the mid-foot regions. There are also orthotics that combine both functional and accommodative features. Examples of accommodative orthotics are braces, splints, casts, gait plates, and night bars. These types of orthotics can be used by anyone, and are used to relieve mild foot pain and to correct minor foot problems. Orthotics also differ in the materials they are made from. 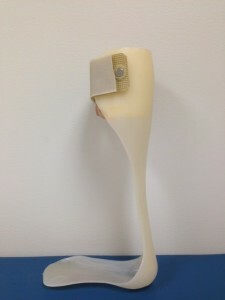 Rigid orthotic devices are typically made of plastic or carbon fiber. Devices made of these materials are usually used to control motion of the joints in the foot. Soft orthotic devices are typically made of soft, compressible materials such as silicone or foam. These devices are effective if a person has arthritis or a foot deformity that causes a loss of protective fatty tissue on the bottom of the foot. Semi-rigid orthotic devices are a combination of soft, compressible materials that are reinforced by more rigid materials. Athletes benefit most from this type of orthotic material. Additional types of materials used to create orthotics include rubber, metal, leather, and plastics. Shoe modifications can be made to reduce pressure on sensitive areas by redistributing weight to areas that are pain-free. For example, heel wedges can be made to promote inversion (turning inward) while resisting eversion (turning outward), and vice versa. Here is a look at the different types of shoe modifications that can be used to improve stability and support. Cushioned (Sach) heel: This cushion is a wedge of compressible rubber that is inserted into the heel to absorb impact during the heel strike. The cushion is also used to reduce unnecessary knee movement by allowing more rapid ankle plantar flexion (when in motion, this is the point when the heel is off the ground and you are moving forward). Heel wedges: Depending on their design, these are used to promote inversion (turning inward) or eversion (turning outward), and prevent the hind foot (the ankle region) from sliding down the incline created by the wedge. Heel flares: These are used to resist inversion or eversion and to provide stability. Extended heel: Also known as a Thomas heel, it runs up the front of the medial side to provide support to the medial longitudinal arch (the highest and strongest of the three arches located in each foot). This can also be reversed to support the front side of the lateral side to provide stability to the lateral longitudinal arch. Heel elevation: This is a shoe lift to help those who have conditions or deformities that leave one leg shorter than the other by more than a quarter of an inch. Metatarsal bars: These bars have a flat surface placed behind the metatarsal head, and are used to relieve pressure from the metatarsal heads. Sole wedges: These medial wedges are used to promote supination or pronation, based on their medial or lateral design. Rocket bar: When patients have problems such as ulcers, this device can be used to shift the rollover point from the metatarsal head to the metatarsal shaft in order to avoid discomfort. This orthotic is evenly curved and lies behind the metatarsal head. Sole flare: These promote stability and can be used to resist either inversion or eversion, depending on their design. Metatarsal pads: Like rocket bars, these pads are used to redistribute pressure and stress from the metatarsal heads to the shafts in cases of Metatarsalgia. Inner sole excavation: This is a soft pad filled with compressible materials. It can be placed under one or more of the metatarsal heads, thereby reducing pressure. Toe crests: These are crescent-shaped pads that are placed behind the second, third, and fourth phalanges to reduce stress and fill the void under the proximal (closer to the body or metatarsals) phalanges. Scaphoid pads: These provide additional support to the bones and joints in the midfoot and hindfoot. Orthotics can also be made for the entire foot. Foot orthoses extend from the posterior border of the foot (the heel bone), to a point just behind the metatarsal heads (the forefoot region) to accommodate an abnormal foot and to help restore more normal lower limb biomechanics. For example, sesamoid inserts are a ¾-inch-thick addition to an orthosis, with an extension under the big toe to transfer the pressure from the shorter, first metatarsal head onto its shaft. UCBL (University of California at Berkeley Laboratory) inserts are made of rigid plastic that is fabricated over a cast of the foot. This device embraces the heel and mid-foot regions, and it has medial, lateral, and posterior walls. Orthotics can also be classified by the region of the foot for which they are meant. For example, AFOs, or ankle-foot orthotics, are designed to control the ankle directly, controlling its position and motion while compensating for weakness or deformities. AFOs are one of the most common types of orthotics, accounting for about 26 percent of all orthotics provided in the United States. AFOs are often used to treat disorders that affect muscle function, such as peripheral neuropathy or strokes. AFOs can also be used to indirectly control other parts of the body, such as the knee or lower leg. They can provide support to weakened or wasted limbs, and they can help to improve conditions that affect one’s gait, such as foot drop or arthritis. In fact, AFOs are sometimes referred to as foot-drop braces. Their design is simple: lightweight polypropylene-based plastic in the shape of an ‘L’ with the calf supported by the upright portion and the bottom of the foot and heel supported by the lower portion. Straps are used to secure the brace to the ankle and leg, and the AFO can either have a fixed or unmovable ‘L’ shape. Or it can be jointed to give the ankle different levels of control. Flexible AFOs: These provide dorsiflexion movement, but do not stabilize the subtalar joint. Anti-Talus AFOs: These do not provide much stabilization to the subtalar joint, and they block all ankle motion. Rigid AFOs: These block all ankle motion, but they also stabilize the subtalar joint and help control adduction and abduction of the forefoot (adduction is bringing part of your body closer to the sagittal plane, which is the center, vertical line separating the left side of your body from the right. Abduction is the opposite of adduction). 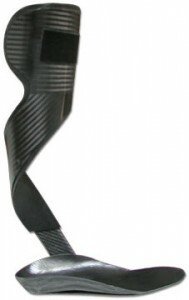 Tamarack Flexure Joint AFOs: These may sometimes help with conditions such as foot drop, depending on their design. They provide subtalar stabilization while allowing dorsiflexion movement and restricting plantar flexion. KAFO: Standing for knee-ankle-foot orthosis, this AFO provides stabilization to the ankle, calf, and knee, and features a self-locking and self-releasing mechanism to improve a person’s gait cycle. These are mainly used on people who suffer from a weak knee joint. They are made of metal, leather, or plastic, and designs include double upright metal KAFOs, single upright metal KAFOs, and Scott-Craig metal KAFOs. Solid AFOs: This has a wider calf shell and does not allow dorsiflexion and plantar flexion movement. Plus, it prevents varus (twisted inward, towards the body) and valgus (twisted away from body) deviations. Spiral AFOs: This is a shoe insert with a spiral that starts in the middle of the structure and passes around the front of the leg, ending at the medial tibial flare, where the calf band is attached. This controls the ankle’s dorsiflexion, plantar flexion, eversion, and inversion movements. Hemispiral AFOs: This is a shoe insert with a spiral that starts on the outside of the shoe insert, passes up the back of the leg, and ends at the medial tibial flare, where the calf band is attached. Hinged AFOs: This orthotic has an adjustable ankle hinge that can be set to allow certain dorsiflexion and plantar flexion movements. Trafo (Tone-Reducing AFO): This device has a broad foot plate that is used to support most of the foot, extending distally under the toes and up over the foot laterally (outside) and medially to maintain the subtalar joint’s normal alignment. TRAFOs are typically used on patients who suffer from cerebral palsy. Posterior Leaf Spring (PLS): This is the most common type of AFO. It has a narrow calf shell and a narrow ankle trim line behind the malleoli (plural for malleolus, the bulge on both sides of the ankle). This device helps weak ankle dorsiflexion movements by resisting ankle plantar flexion movements while walking and during swing phase, with no middle or side control of the ankle. There are also several types of orthotics for your lower limbs. KAFO is one example. There are also hip-knee-ankle-foot orthotics called HKAFOs, which consist of pelvic girdles, bands, and belts in addition to a KAFO. Hip-joint orthotics position the wearer sitting upright at 90 degrees, while the knee joint is centered over the medial femoral condyle. The bulge at the bottom of the femur bone that articulates with the tibia and patella to form the knee joint. You can see the femoral condyle best when the knee is bent. THKAFOs, or trunk-hip-knee-ankle-foot orthotic,s consist of a spinal orthosis in addition to a HKAFO for control of trunk motion and spinal alignment. Patients with paraplegia often use these devices. Special-purpose lower-limb orthotics are also available to help people with weight-bearing issues, fractures, deformities, and congenital hip dislocation problems. These special-purpose devices can help patients regain or resist joint movements, take weight off the lower limbs, and correct or control an abnormal gait or deformities such as clubfoot. Here we will discuss how custom orthotics are made. Usually the doctor will make a plaster cast of the patient’s foot, called a negative impression. The cast is then sent to the lab with a prescription for recommended modifications. While at the lab, the negative cast is turned into a positive cast by pouring plaster into it. When it dries it is removed, giving the shape of the bottom of the patient’s foot. Once the dried cast is ready, a lab technician custom-molds the orthotic device using the recommended modifications as a guide when making adjustments. Once all adjustments have been made, the device is sent back to the doctor, who then fits the patient, typically within weeks of the initial casting. 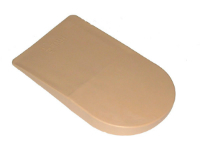 The orthotic provides support, stability, cushioning, and alignment to the patient’s feet, ankles, and lower body. This allows the patient to gradually become free of pain. Just about anyone who feels they need some type of additional support for walking or running is a good candidate for orthotics. Orthotics are especially good for people who want to relieve or prevent common foot problems that are known to cause pain, swelling, and discomfort. If you feel discomfort when you walk, you should seek help from a podiatrist, a foot and ankle surgeon, or some other type of foot specialist. They may be able to help you decide which orthotics device would be best for you. Remember, the longer you leave a problem untreated, the more likely the condition will worsen. Each of these brands offers different sizes, styles, colors, and types of devices, ranging from inserts and wedges to orthotic sandals and shoes. The best way to figure out which brand and style are right for you is to speak with a foot specialist—a podiatrist, not the sales representative at Foot Locker. The cost of your orthopedic device will depend on the brand name, the location of purchase, whether the device is over-the-counter or prescription, the type of device (insert, custom-made, etc. ), and your insurance coverage. Generally, inserts and wedges can be bought at a local pharmacy or specialty retailer and range in price from $7–$50. Custom-made devices can range from $100–$500, but this too depends on the doctor, the materials used, and the type of insurance coverage you have. Orthotic shoes made by companies such as Adidas, New Balance, Brooks, K-Swiss, and others can be found ranging from $20–$150. AFOs can usually be found priced from $500–$700. If you are curious about orthotics, or think you may need a device, talk with your podiatrist or another type of foot specialist about the problems you would like to address. What brand offers the best support and comfort? Can the orthotic device you recommend be purchased over the counter or for less money? If I begin using orthotics, will I need to wear them for the rest of my life? Is there anything else I can do to prevent foot problems or foot injuries?